Hello and happy Tuesday. I didn't post yesterday because it was a holiday. What a nice treat the three-day weekend was! So, week 9 of IMLP training was pretty good. I had a couple of tough workouts in there, including a bike time trial (more in a second) that I did-not-enjoy. At all. But it was a necessary evil. I was also thrilled that I only needed one run on the treadmill. The weather was much more cooperative this week than the week before. Here's a recap but first look who is back! I am obsessed with grumpy cat and I'm sorry but he is going to be paying a lot of visits. 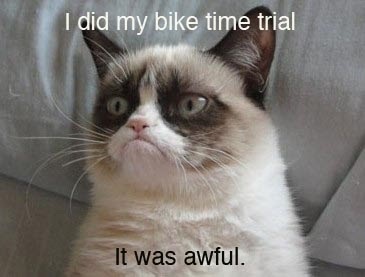 Grumpy Cat is also Truthful Cat. Preach, Grumpy Cat, preach. This particular Monday swim workout that I had this week is my least favorite one I have to do, and I don't know why: it's 400 yards easy, then 6 x 50 yards hard, then 400 easy, then 6 x 50 hard, then 400 easy and then ends with a 6 x 50 yard drill. I get irrationally annoyed at this swim workout. Tuesday. Tuesday was the time trial on the bike. I knew it was coming and was dreading it with ever fiber of my being. Basically, the time trial is used to set heart rate zones, and I knew from Amy and Bill (who had already done their time trials), knowing heart rate on the bike is incredibly useful because our coach could then give concrete heart-rate numbers to hit when doing the trainer. Still ... the idea of going "all out" on the bike for a full 30 minutes made me want to cry. The time trial started with 15 minutes of easy pedaling and then it was 30 minutes as hard as I could go. I survived but it was hard and many many bad words were thought and said. I need to thank my hip hop playlist for getting me through the time trial. I just pushed as hard as I could go, put my head down and tried to hang on. I knew if I started to look at my timer (I use the timer on my iPhone) I would never stop looking at it, so I forced myself to not look at the timer until 7 songs had passed. I would alternate my position between holding the aero bars for one song, then hitting the drops for another, then the hoods, and back and forth and back and forth. It broke things up nicely. And before I knew it, it was done. I was sweating like a wild animal -- probably because I was, in fact, a wild animal. See -- here I am right after. Hot. In every sense of the word. For Friday's long run, I wore one of my new favorite running shirts: a long sleeve bright neon number from the Under Armor outlet. First, yes, it is neon. You may have noticed that I really love neon, and while it is partly true that I wear neon on my runs so that cars will see me and not hit me, it is also very true that I just love neon and bright colors. Especially pink. Here I am after my run with all my gear. Note the headlamp [Bill: calling you out in front of the entire internet - WEAR A HEADLAMP] and safety patrol reflector vest. Just a note from a vanity standpoint: I am wearing a long tank bra and a long sleeved shirt under that yellow neon top ... so that accounts for a lot most all of the lumps under my shirt. Just a word of caution that Under Armor fits snugly and, in my experience, on the small side. But more to the point: this Under Armor top is really cool. It's like the MacGuyver of running tops. It's really long, so it covers my hips and it is that nice wicking material so it keeps me warm but not hot. OK here comes the MacGuyver part. Prepare to have your mind blown. The neck has a sort of turtleneck that you can pull up over your face, like a built in balaclava. It has a mesh panel in front for easy breathing. It is great. And when you get warm, you can just pull it down and it keeps your neck warm. The sleeves are equally genius: they fold over to create little mittens. And then you can pull them back when your hands get warm. This is exactly what I did. Now, if it is a really really cold day, this won't cut it and you'll need actual gloves. But on a regular cold day, this kind of sleeve is perfect. Sorry this shot is blurry. And I promise I'm not giving an obscene gesture. My swim on Saturday was the longest swim I've done in IMLP training to date: 2300 yards (which is about 1.75 miles). It felt really good and was a tough workout. I also really liked that I shared the lane with two different guys: older man was in the lane when I got there and I really liked that he kicked a ton of water when we passed each other. I always welcome that kind of thing because it's what I face in races. At one point older man got out and younger man came in. Younger man was faster than me, so I would try to keep up with him and/or draft off of him. I came out of the pool feeling really good and I knew I could have kept on going, which is a good thing because at Placid, I'll still have about 3/4 of a mile more to go. I also liked the brick on Sunday - this was the first one where my coach had me running a tempo (i.e., fast but not sprinting) pace. Usually the bricks have been an endurance pace run (which means comfortable). But Sunday's run had me starting out at 8:10/8:20 pace for two miles and then dropping back to endurance pace for 10 minutes to end the run. My first two miles were 8:04 and 7:55 pace. It felt so good to run so fast. That's all for this week! I am really looking forward to Spring this year - I cannot wait to swim and bike outside. I bet Grumpy Cat hates Springtime. Public shaming will get you no where Tiny Ma'am. You may desire to look the part of an safety obsessed crossing guard, but not me. Admire your persevere to do that.